It’s been 18 days since my wife, Sara, and I found a stray dog in a gas station. It’s been 18 days since we cleaned him off, fed him, and named him Carlin. It’s been 18 days since we learned Carlin was in the advanced stages of distemper and we had to put him down. It’s been 18 days since I cried for the first time in years. I knew I’d become a dog person already. What I didn’t know was the extent. For two years, we had a little Puerto Rican roommate named Bea Arthur that showed me just how much I could love a dog. But in just a few hours, Carlin taught me that loving one was not enough. I will never forget the shock of the vet telling me that Carlin had distemper. We knew something was very wrong. But the optimist in me thought everything would work out. The optimist in me likes to get my hopes up just enough to set up an impending heartbreak. Turns out the optimist in me is also a sadist. There was a brief moment when I was thrilled that the vet agreed to take Carlin in, before I realized that he was taking him in just to end things mercifully. That emotional cliff dive was like nothing I’d ever experienced. I went from the relief of knowing Carlin would be cared for to the anguish that this was somehow our fault. We were happy to give Carlin his literal moment in the sun. But, as illogical as the thought was, I couldn’t escape the fear that we were partially responsible. I wrote a column about Carlin – both as catharsis for me and a tribute to him. I must have re-read it a dozen times, hoping that somehow the results would be different. But you can’t change the ending. Ilsa gets on the plane, Soylent Green is made of people, and the boat always sinks. Sara and I weren’t whole for days. The oddest part was when we’d interact with other people. When you’re that emotionally distraught, it’s difficult to understand that everyone around you isn’t just as sad. Even a world champion in empathy can’t truly relate to someone else’s loss. We couldn’t connect to anyone. Well, we connected to a few people. We live in the top floor of a house, owned by a wonderfully sweet couple named Larry and Lee who have an adorable mutt named Hannah. Months ago, we’d asked if they would allow us to have a second dog; we assumed that due to our shared love of everything pup that they’d relax their previous one dog policy. We got a resounding no. After we lost Carlin, a second dog wasn’t even on our minds. We knew the rules – and having just lost our brief friend, we were gun shy. But Lee could tell something was wrong. Having trouble explaining what had happened, I pointed her towards the column. A few hours later, I received an email from them that didn’t just allow us to get a second dog – the email pleaded for it. This time, we didn’t ask for them to let us get a second dog – the universe did. 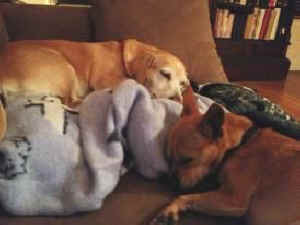 It turned out that Larry and Lee had just rescued another pup of their own, and they could see just how good of a home we would be for one more. That email was the first time I’d truly smiled since we lost Carlin, and I had done a show the night before. Outwardly, I’d smiled plenty. But that was the first time I meant it. I was excited that Carlin’s death would save the life of another dog. And the sheer volume of support we received regarding Carlin was staggering. Close to 250,000 people read the column, and it was shared all over Facebook, reprinted in blogs, and even appeared in some newspapers. Carlin’s life hadn’t just touched us – it touched everyone we told. I was inspired. I spent a few days building EndTheMills.com, a website based around the idea that with simple legislation we could end puppy mills forever. I didn’t want Carlin to just save one dog. I wanted him to save them all. It was an immediate success – through signatures, publicity, and donations, there is a realistic possibility that my little gremlin could be the catalyst to end the systematic overbreeding and abuse inherent in the mill system. The ending of Carlin’s part of the story couldn’t change – but the movie wasn’t over yet. Sara went home for a week to visit family, and then I had a few gigs. So this weekend was our first chance to adopt a little brother for Bea. I’d gone through the seven stages of grief – shock, guilt, anger, depression, the turn around, reconstruction, and hope. As much as those few hours with Carlin will always be with me, I knew that the real way to end the movie was to find the first dog who’s life Carlin would save. 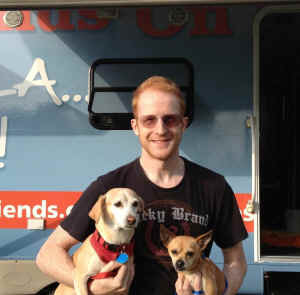 We went to No Kill Los Angeles, an adoption event sponsored by Best Friends Animal Society where dozens of rescues and shelters bring over a thousand animals to be adopted. We didn’t know if we’d meet “the one” there. But it was a great chance to try. I never imagined that I would be looking for a second dog – let alone a Chihuahua mix - but I wanted to find a dog that reminded me of Carlin. The first dog we met was Jack – a sweet little guy from Best Friends themselves. But it would be ridiculous to fall in love with the first dog we met. And one named Jack? That’s the grandfather I wanted to name a child after. Fate couldn’t be that obvious, could it? After meeting several more with too much energy for a family of couch potatoes, we found a second candidate. Charlie had been fostered by a rescue for close to a year, and was incredibly chill. He was great with people, great with other dogs, and grateful that we wanted to meet him. But our heart, somehow wasn’t in it. Maybe it’s because Jack looked more like Carlin. Or maybe because Jack was smaller and needed more help, or maybe because we just met Jack first. Whatever the reason, Charlie reminded me of the platonic friend you know would be a good choice to date, but there’s just not enough spark to go through with it. Sorry Charlie – we’re just going to be friends. So where is the happy ending? I’m writing this, sitting on my couch, while Bea Arthur and Mitch Hedberg are asleep next to me. We changed Jack’s name to Mitch – I may not ever have a son, but if I do, I’m keeping the name Jack available. Besides – Mitch is a fitting tribute to Carlin, another one of comedy’s greats. And Mitch Hedberg was a one-liner guy. Seems right for a dog small enough for me to palm. Bea is a wonderful big sister. Despite how selective she can be with other dogs, I feel like somehow, she knows. She understands that Mitch is family. It’s been 18 days since everything changed. It’s been 18 days since I started grieving. And it’s been 18 days since we got to spend one afternoon with Carlin. But that afternoon will allow us to spend a lifetime with Mitch. And hopefully, it will inspire other people to help us end the mills permanently, preventing street dogs like Bea, Mitch, and Carlin from ever needing a home again. The movie isn’t over yet. That happy ending is up to you.